Raft: Load it down with gear and still provide comfortable seating for passengers. Rafts are versatile and fun. Cataraft: Gear and passengers are no problem for this boat. Customize your frame to accommodate your needs. Flat Area: The measurement of the flat surface on the top of the side tubes that determines the maximum side rail length for rowing frames. This is the area where frame side rails are placed. Kick/Rocker: The area where the front "kick" and rear "rocker" of the boat curves up. Increased rocker pushes the raft up and over large waves. The higher the kick the less surface area of the boat is touching the water allowing for greater maneuverability. A lower kick allows for increased stability and places the guide closer to the water for increased control. Increased kick = a fun ride that allows you to feel the waves. Center-to-Center Width: The measurement used to determine the width of frame needed for your raft. The easy way to measure this is: total width of the boat - 1 tube diameter = the Center-to-Center width. Note: When the Center-to-Center measurement of your boat falls between the available sizes it is better to choose the wider width to avoid having the frame slip inside the boat. 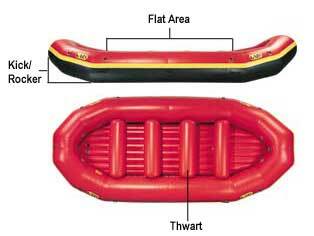 Thwart: An air filled tube that spans the width of the boat. These provide stability for the boat and also can be used as a passenger seat and/or foothold. There are two types, removable and fixed. Removable thwarts give the option of removing or changing the location of thwarts in the boat. NRS uses a BAT™ (Batten Attachment System) to secure removable thwarts. Fixed thwarts (disk thwarts) are glued into place and do not have the option to be removed or moved. Floor Purge (Pressure Release) Valve: Releases air from the floor to protect the boat seams when pressure increases due to sun exposure. The release will only occur when the floor PSI exceeds 2.4. The location of this valve on NRS boats indicates the stern of the boat. Rubber stops are available to keep sand from entering into the valve. Standard Floor: This boat has a water tight floor. A bail bucket or bilge pump is required. If filled with water this type of boat is difficult to maneuver through rapids. These are a great economical option for fishing on flat water. Self-bailing Floor: This type of floor allows for water drainage around the perimeter of the floor. This floor inflates to give a sturdy and stable feel. This floor type is the preferred option for most whitewater boaters due to its quick draining ability which allows for maintained control and increased maneuverability throughout rapids. oz./denier: Standard measurements used to describe boat materials: Ounces (oz.) denotes the weight of a square meter of material. Denier, the weight in grams of 9,000 meters of thread, is an index measurement used to indicate the strength of the woven base fabric in the material. NRS Pennel Orca® boat material: Durable, flexible material that is highly abrasion, UV and chemical resistant. Used in NRS Expedition and Otter rafts, River and Kodiak Catarafts and MaverIK inflatable kayaks. 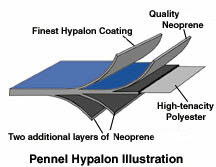 Note: NRS uses high quality and reliable Pennel Orca Fabric. Urethane: A tough and durable plastic coated material. Great for mildew and abrasion resistance but not the best against UV degradation. Urethane boats are bonded thru a heat-welded process. PVC: A plastic coated material. Manufacturers such as AIRE use a urethane bladder inside a PVC outer shell. PVC is highly abrasion resistant and offers a smooth outer surface that glides over the water and is less "sticky" to rocks. These boats also have heat-welded seams. D-rings: A secure way to hold your gear and frame down. Most rafts come with 6-14 2'' stainless steel D-rings depending on the boat. Extra's can be purchased to customize your boat. D-ring installation instructions. Footcups: Glue in footcups to your paddle boat to give you a secure place to put your feet and power through waves. Boats do not come with footcups but are an option to be purchased and added later. Carry Handles: Most rafts come with plenty of these for easy lifting in and out of the water. Attach your own EasyCarry Handles™ wherever an extra hand hold is needed. EasyCarry Handle™ installation instructions. Cargo Nets: Toss a cargo net over your gear, cinch it down with straps, and it will hold your bags and boxes in the boat even through the wildest ride. Raft Cargo Floor:Holds your gear off the floor of your raft. The mesh floor allows for drainage and keeps your gear from sitting in water. Cargo floors are most often used in standard floor boats to prevent gear from wearing holes in floor fabric when scraping over rocks. Cataraft Cargo Floor: Gives a quick draining floor to your cat. These cargo floors are great for supporting all your gear or your feet. This floor also reduces splash for rower and passengers. Not recommended for long periods of standing. Cataraft Aluminum Floor: Recommended for flat water rowing where long periods of standing will occur. Great to hold loads of gear for a long weekend fishing trip. This aluminum floor is heavy duty and long-lasting. The addition of an aluminum floor to your frame lowers the center of gravity making it a very stable cataraft. Flip Lines: A helpful addition to any overturned raft or cataraft. Two flip lines are placed on one side to aid in righting the boat when overturned. Bow-Line: Use a bow-line bag full of rope to secure your boat to shore so you can save your rescue rope for emergencies. Rescue Bag: An absolute necessity on the river. A highly visible bag with a 75' rope is an essential accessory to any boat. If used properly a rescue bag can safely help a fellow boater in need. Safety Whistle: Always a good and inexpensive safety accessory for any boater. Attach a whistle to any PFD or leave attached to the frame near the rower to communicate with other boaters. Inflatable Boat Cleaner: An easy-to-use cleaner for PVC , Hypalon®, Vinyl, Fiberglass, stainless steel, and chrome. Dirt, oils, aluminum frame oxidation marks, white oxidation, and diesel smudge will easily dissolve. Rinse surface before applying. 303 Protectant: Protects all your equipment from harmful UV rays, and maintains the integrity and tear strength of nylon materials, rubber compounds (including neoprene), plastics, plexi-glass, leather, fiberglass, EPDM, vinyls, and even wood. Wipe on your raft or use as a rinse for PFD's and wetsuits.